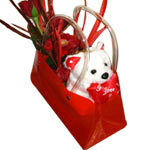 Product description: Surprise someone special with red flowers and teddy delivered in a stylish contemporary plastic beg. It will be brighten their day - for days. All of our favorite flowers from the garden are in this gorgeous bouquet. 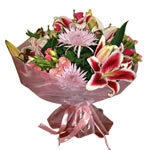 This bouquet contains of lilies, roses, exotic flowers and more. 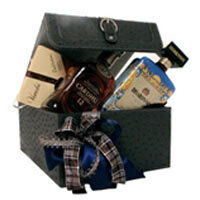 An impressive gift for any occasion. Red is the colour of strength, energy, fire. 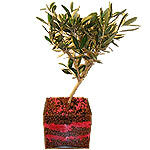 Send this flowers to your beloved person to make their day as bright as these flowers are. 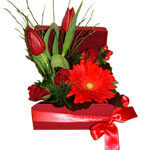 This arrangement is consist of red roses, tulips and daises. 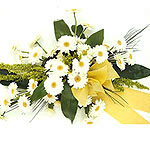 Pure Serenity flowers are a timeless tribute for any gentle soul, or as a display of funeral flowers for one who was much-loved. 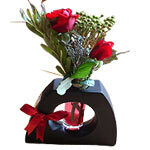 Simply charming, this arrangement of three roses is placed in a glass vase. The number three signifies beauty and spirituality in traditional folklore, making this simple rose arrangement a truly meaningful gift.